Sunday funday front page news- weirdly juxtaposed with not so fun news. I take off my jacket- it’s sunny, I’ll lose the pullover too. I ride over to the edge of the trees, jump off the groomed path and into some waist deep snow to do my second pre-race bladder evacuation. Almost race time, I roll back over to the start and squeeze to the front. “Ok guys! Welcome to the first Fat Cycle Challenge! Thank you sooo much for coming! Hooray! And yay!” says the very blonde lady in a thigh-length puffy jacket from the Aspen Chamber of Commerce. I stand up and sprint, which on a fat bike isn’t nearly as fast as it sounds. I try to shift my Alfine into a high gear. Click, click, nothing. Back off the power, let the gears move around in there. I lay off, it clunks into gear. Damn internal townie hub. Stand up and try to sprint again. I get the hole shot going into the first turn. Then one of the guys from Borealis gets on it and sprays snow at me. Gone. Damn he’s moving fast. A second Borealis guy passes me. I try to hold his wheel. We’re moving fast now- the snow is groomed and pancake flat, I’m in eighth gear and spun out. My jaw tightens up from breathing the cold air. We turn up the only rise on the course- a quick 50 feet up, 50 feet down on snowshoe packed singletrack, then a few more feet on some sugary un-packed powder. I make up a little time on the climb and descent, run the powder section, then hop back on the back on the bike at the groomed track. The Borealis guys pull away from me immediately. After the hike, we have to accelerate from a dead stop. On their 22ish pound carbon bikes, they’re up to speed almost immediately. Getting my 40ish pound internally-geared Pugsley to move is as frustrating as drag racing a dump truck. 2nd gear, spin, stop pedaling, shift, 3rd, stop, shift, 4th, stop. And so on. I’m half way around the four-minute loop before I’m back in my top gear, one more turn, up the climb, down, hike, and start the process all over again. There’s a third Borealis guy right behind me, I gap him a little on the single track, but once we’re back on the groomed trail he rolls right back up to me. Every lap. Damn. I’m going so hard I feel like I’m going to puke. But at least I can move my jaw a little now. I run through the powder at 45 minutes. That third guy is right behind me. Remount, try to sprint. 2nd, stop, clunk, 3rd, stop, clunk. Man, I so hope this is it. I’m losing it. Across the line. “Hey man, coming on your left,” I weeze to a lapped rider. I look back, I’ve got a little gap on the Borealis guy going into the climb. Up, down, run. Remount, sprint. Across the line. Didn’t get caught. Thank god. Dammit that was hard. After the race, I headed into Aspen with the Aloha guys that I’m going to be working with this summer. There was a fat bike demo in Wagner Park in the center of town. 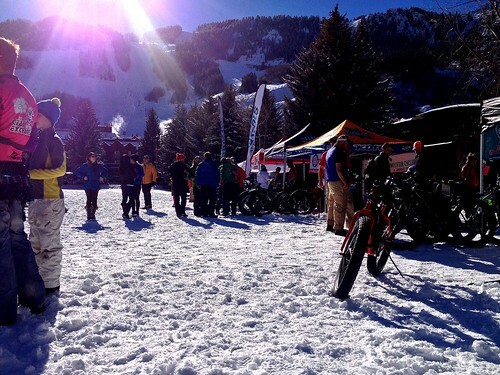 We set up a tent, along with the Borealis guys, and two other shops from this end of the valley- the Gear Ex and MG. Weirdly, there was only one shop from Aspen that participated. 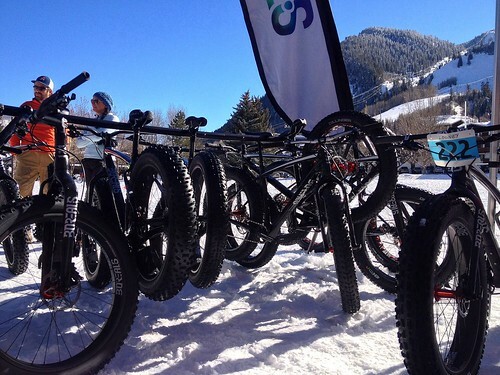 Lots of people were stoked to pedal fat bikes around the snowy field. Including a British guy that looked like Sting, and his very frail son. “Yeah, yeah, it can be haahd riding those. Heavy bikes you know. Real haahd.” shouted the Scatman from Boston as he grabbed the bike back from the skinny English kid. Cultural differences. After the demo, there was a town ride on Aspen’s groomed bike paths- they don’t shovel or salt the bike paths, they actually run a groomer on them. Then there was a pretty low key after-party in the Limelight Hotel with tiny pizzas and Aspen Brewing Blonde Ales (Aspen is a very blonde place). Colleen came up for a while, then we went and ate some decent tulip-fed-imported-from-Denmark barbecued pig meat. It wasn’t quite as good as the stuff you get from a guy with a pull-behind pit by the side of the highway back east. Fun day though. The entry fee was reasonable at $30, the payout was good- $300 for first. I wish more races in Colorado were that affordable. 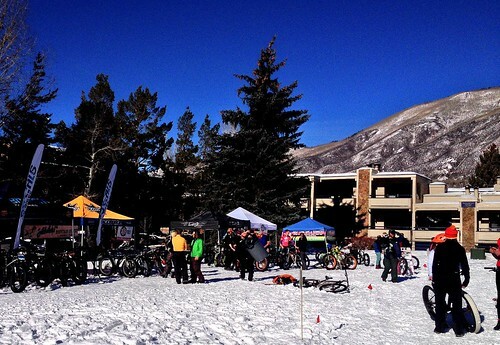 The course was pretty fun for a snow crit type race. A longer and more technical loop would have been sweet, but that’s mostly because I’m not very good at pedaling my bike fast on flat ground. It’s super cool that the event was organized by the Chamber. Any place that puts on an official bike event is a ok place in my book.